Ljubljana has always had a strategically good position for travelling between Italy, Central Europe and the Balkans. Nowadays it’s easily accessible due to a well developed network of railways and roads. Slovenia has one airport named »Jože Pučnik airport«. Ljubljana airport is 20 km north from Ljubljana. The city center can be reached quickly and in comfort by public transport. The buses take you direct to Ljubljana city center. Or you can take the bus to Kranj and then take the train to Ljubljana or other cities. From Ljubljana airport you can also take private transfer to city center for reasonable price. You can choose from a number of international airports close to Slovenia, depending where you are coming from. The biggest airport with the most international flights is Venice in Italy. You can fly to Venice from all over Europe and also directly from North America, North Africa and Middle East. Another Italian airport is Trieste, which is located more od less on Slovenian border. If you are travelling to Eastern Slovenia, the best solution is to fly to Zagreb in Croatia. During summer there are many flights also to Rijeka and Pula in Croatia. In Austria, the closest airports to Slovenia are Klagenfurt, Graz and also Vienna. Bus station Ljubljana is next to the train station and has services throughout Slovenia and to foreign countries. Ljubljana’s main train station called »Ljubljana« is located just short walk from the city center. Slovenia has a developed network of railways. Local trains run throughout the country. Direct international connections include Zagreb, Rijeka, Graz, Salzburg, Vienna, Munich. If you come with a car you can park in P+R areas just for 1.20 € for 24 hours. You get additional two tickets for public transport. You can also park at parking houses in the city center. Renting a car is always a good option, especially if you are visiting destinations outside of Ljubljana. 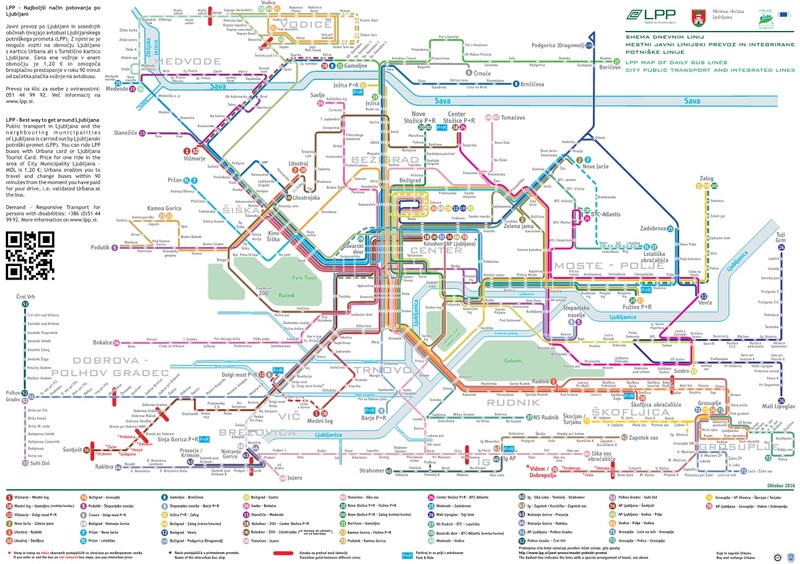 If you intend to use bus transportation in Ljubljana, you need to buy Urbana card. You can get it for one time fee of 2€ at tourist information centers, most city street kiosks and post offices hold it as well. One journey costs 1.20 € and allows you to change as many busses as you need in a time of 90 minutes. Brings tourist from the city center to the Ljubljana castle. There are boats offering short trips on the Ljubljanica river. The boats depart from under the tiny white bridge nearby the Triple bridge.